Watched a wonderful film this weekend: Vozvrashchenie (The Return). 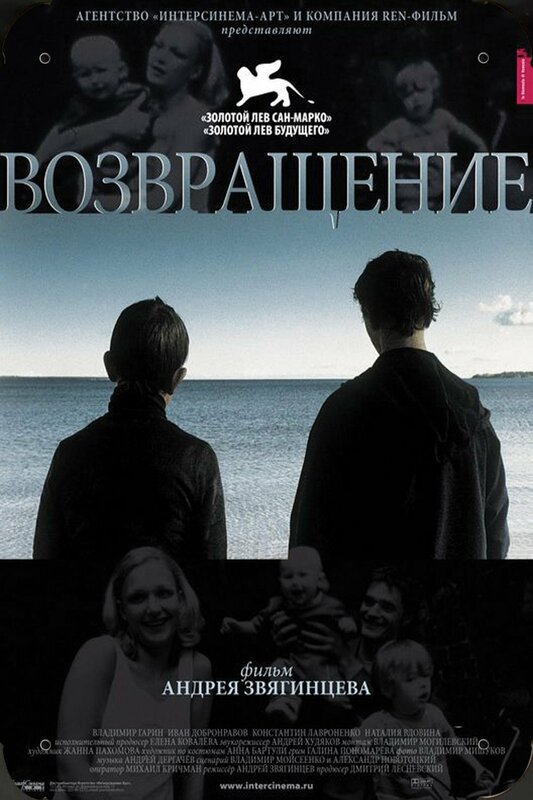 It is the story of two boys, Andrey (about fifteen) and Ivan (about twelve), whose father returns unexpectedly after a twelve-year absence. He takes the boys on a week-long “fishing trip” on a remote island, with tragic consequences. The film can be read quite simply, as the visual representation of a diary that we see the boys keeping on the trip. The boys take turns writing in the diary, and the film swaps perspective at these times. The Return could be a simple recounting of a traumatic week in the lives of two boys, but it would be a mistake to read it this simply. The first time we see the returned father is also clear confirmation that the film contains deep symbolism. The scene composition exactly echoes Mantegna’s Lamentation of the Christ. We feel that the film tries to identify the father with a Christ-like figure beyond the obvious parallel with the painting – for example, the father wants his sons to call him otets (father), not papa (dad). This introduction of the father is a bit of a surprise. 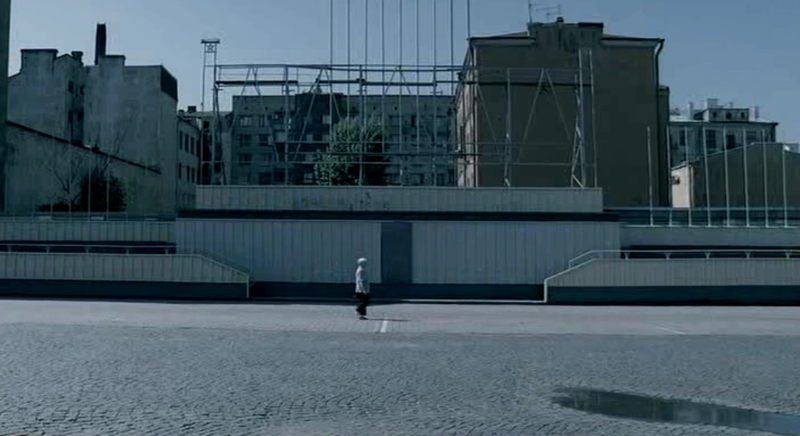 In the preceding scene the two boys have a fight in an underground parking garage after which they run home to their mother, possibly to tell her and be comforted. She simply turns round, and answers “Quiet. Dad’s sleeping.” The boys find their returned father sleeping on a bed in the pose above. I think it telling that the boys then do not tell their mother about the fight – the returned father immediately changes the boys relationship with their mother. Suddenly, a fistfight, the epitome of male aggression, is no longer discussed with her. The father’s return (and absence) is not explained to us or the boys. The family sits down to their first (and as it turns out, last) supper in twelve years, and the boys are almost immediately informed that they will be joining him on a fishing trip. Andrey, eager for his father’s approval, manages to seem excited, but Ivan cannot hide his misgivings about going on a trip with this stranger. There is a lot the film doesn’t explain. This non-explanation does not feel manipulative (withholding information from the audience for the sake of tension) but tragic – the boys, like us, never receive an explanation either and we feel their confusion as they try to make sense of a changed world. The photography is gorgeous, but the atmosphere of the film is bleakly foreboding. It’s a desolate and bare world: we see very few people other than the main cast, town scenes are grey road surfaces, empty communal spaces, bare buildings with washed-out blue or otherwise leaden skies. The country scenery is faded shades of grey and blue with cold skies. Scenes of great open spaces feel enclosing, limited, decaying and abandoned. The palette is consistent cold colours in desaturated shades. There seems to be a suggestion that the film has themes of tests of manhood, of ascension to adulthood. The film opens as a group of (mostly pre-pubescent) boys, including Andrey and Ivan, climb a huge phallic tower. Andrey launches himself from this tower into the wide open water, but Ivan, scared of heights, cannot bring himself to jump. The boys abandon him, and he is stuck on top until, tellingly, his mother rescues him. Interestingly Ivan is called a ninny or chicken by the other boys due to this – this leads to the fight with his brother as mentioned earlier, but I also think it is a reference to Ivan Durak – Ivan the fool, the ninny, the younger son of Russian folklore. A stronger theme than tests of manhood is that we are seeing a depiction of a father who is not equipped to teach his sons how to become men. He is fundamentally broken himself and cannot deal with his sons nor instruct them on how to act in the real world. The film handles this with sympathy and compassion as well as a deep sense of sadness. For example, the father gives Andrey his purse so that he can pay for lunch. Andrey is obviously proud of this new responsibility, but the purse gets stolen as they exit the restaurant. The father catches the thief, and brings him to the boys so that they can beat him up. The boys decline, and the father gives the thief some money for food before letting him run off. What lesson should the boys learn here? There is little that can be learnt other that the father is dangerously unpredictable and ill-equipped to navigate the waters between aggression and kindness. The father watches a woman walk past the car in the car’s mirror, and all he sees is her hips, buttocks and legs. Ivan watches the same scene but he sees her face and smile. Before the father’s return Ivan was in a house with his brother, his mother, and grandmother. After his father’s return he is in a car with only male figures and the only woman they see gets objectified by the father. The “fishing trip” is not a fishing trip – the whole trip is an excuse to for the father to go on some unnamed secret quest. He doesn’t explain any of his plans – we just see him making mysterious phone calls, picking up items, and having unexplained irrational reactions to things. 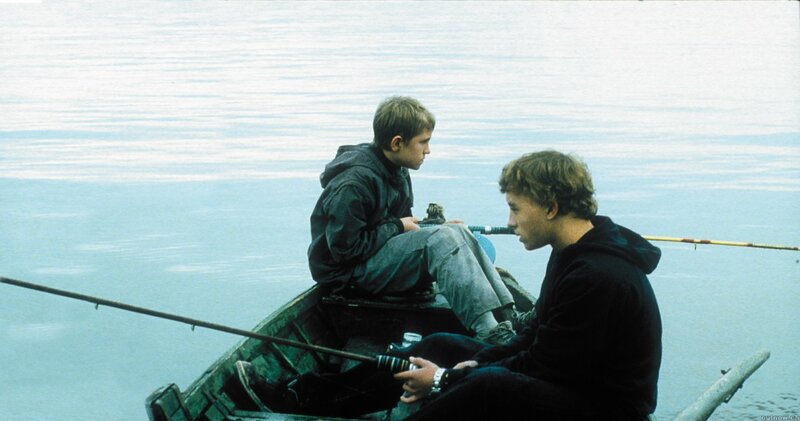 When the boys finally manage to catch a fish on the “fishing trip”, the father declines their offer of food, saying “I’ve eaten enough fish in my life”. I didn’t understand this comment – but a friend mentioned that this might mean that he has spent time in prison, as fish is Russian prison food. What irrational behaviour we see from the father and what secrets are exposed to us are not as important as what we never see. It turns out that the father’s quest during the “fishing trip” is to retrieve a small box containing something secret, but we are never shown what this secret is. The box holding the father’s secrets it is quite small. Throughout the film we see the father carrying what we imagine to be quite big secrets, including something that looks like a human body wrapped in cloth. In the end, none of these items are what we imagined them to be, and the dirty container of secret things that made him act so irrationally is objectively tiny. Secrets that seem small, inconsequential, or easily forgivable to those not shamed by them can still be a source of great anguish to their keeper. The film shows this; the father’s secrets were hidden on a faraway uninhabited island, in a hole inside an abandoned house, in a bigger container, and then also locked in the small container. Whatever demon was inside may be small to us as outsiders but it terrified the father. The fact that his box of secrets vanish along with the father is also important – we never quite know all the secrets or understand all the reasons for the behaviours we see in our parents, just as our children never will with us. There is also something shown of the resilience of a child – the two boys find the hole the secret was hidden in, play in it, and in it get worms for their fishing attempts. They manage somehow to function within a broader dysfunction. Even with a father unequipped to teach his sons how to become men the boys do, in fact, become men through some unnamed process. At one point their car gets stuck in the mud, and the father sarcastically tells his sons to use their “little hands” to put sticks under the wheels. They fail, and the father needs to do it himself to get the car unstuck. 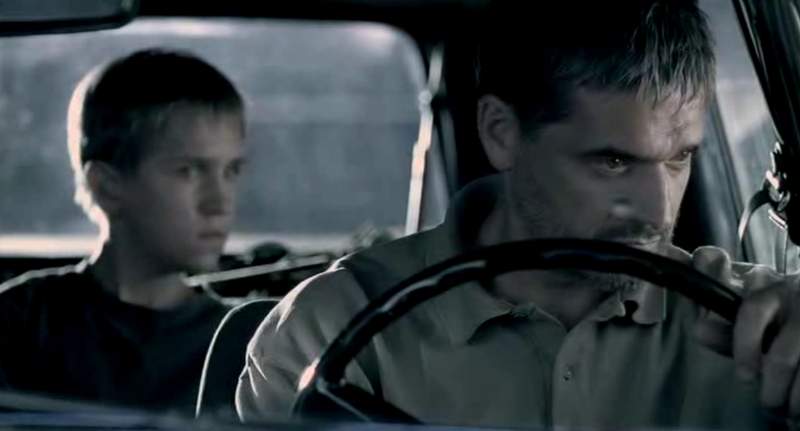 At the end of the film the boys’ “little hands” are adequate and they manage to push sticks under the body of their dead father, upon which the boys transport him to his final resting place. The last time the film shows the (now dead) father we see him in the exact same pose as Mantegna’s Lamentation of the Christ. Thus linking the symbolically dead father figure at the beginning of the film with the corporeally dead father at the end of it. The film addresses (and possibly questions) the value of aggression, along with the fear of own aggression, as being part of the standard definition of masculinity. Andrey is being beaten by his father and Ivan grabs a knife to defend his older brother. Ivan is absolutely terrified by his own aggressive response and runs off, climbing another huge phallic tower, from which he threatens to jump. The father falls to his death as he tries to save Ivan from jumping. This, to me, is the tragedy of the film. Had Ivan murdered his father in defence of his brother it would have been a cleaner ending. But his father died while trying to make amends, and we see the tragedy of a broken parent trying their best to function in complex situations – something that in the film, as often in real life, leads to the child carrying tremendous guilt. There is a universality to this, as we are all someone’s child in some ways. From a narrative viewpoint this serves as a hat tip to Greek tragedy, but it’s a dark end to a bleak, but brilliant, film. The ending credits show the photo diary the boys kept during the trip. The boys look happier than they do at any point during the actual trip – this suggests some distance from the trauma, some mellowing and insight. It is telling that the father is never shown in this last set of photos. The credits has a wonderful photo of Ivan that shows the duality of this type of transformative experience. 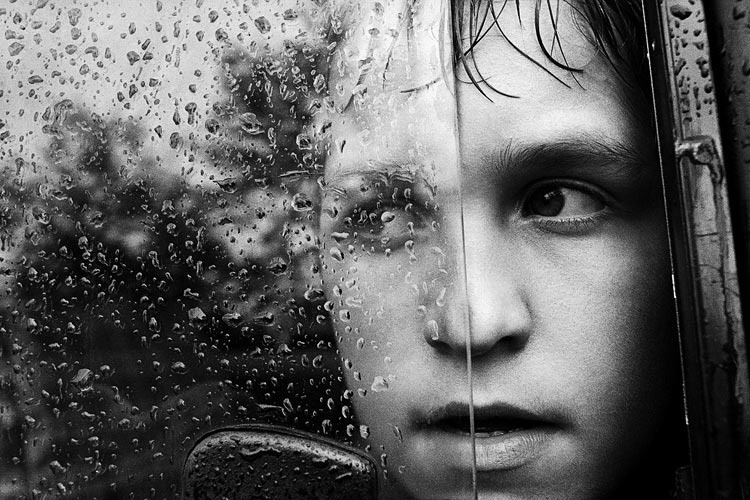 His face in the car window, half of it in the fresh air, the other half blurred by tear-like droplets on the window.